It happens a couple times every season. Some nights, things just don’t fall your way. 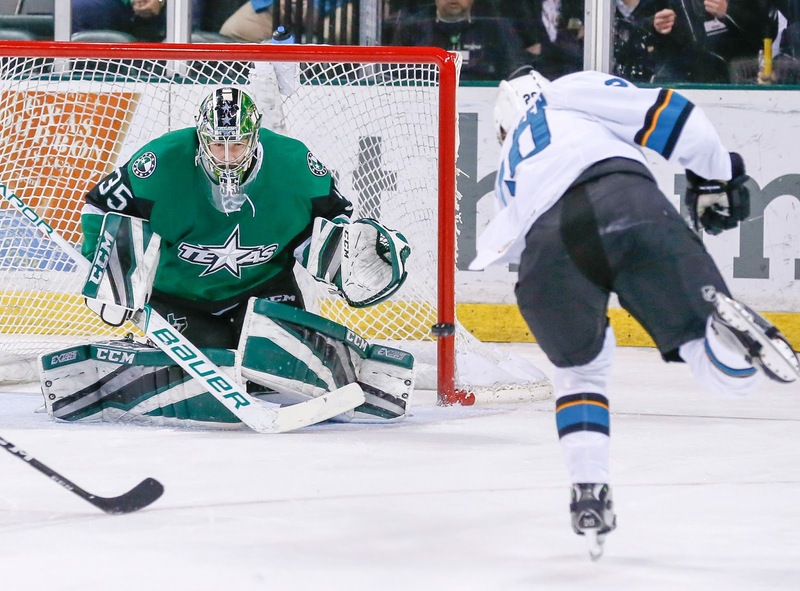 Tonight, that was the story for the home side as Texas suffered a 6-1 defeat at home to the Pacific Division leading San Jose Barracuda. Laxdal split the blame for each goal equally with three on the forwards and three on the defense. Texas is truly suffering from missing of Reece Scarlett and Gavin Bayreuther in the lineup. Denis Gurianov continued his point streak with an assist but broke his goal streak at six. The Stars scored first and early, seemingly setting themselves up for a good night. Michael Mersch got a redirect on a fade-away shot by the hot Gurianov. The Barracuda came back hard with two quick ones. Halbgewachs and Middleton scored just 61 seconds apart to set the score at 2-1 for San Jose in short order. The second period was really where things broke open for the Barracuda. Manuel Wiederer scored early in the period for what was still a manageable differential for Texas. Dillon Heatheringon put one off the crossbar on the power play and later Ben Gleason hit the iron on a drive in deep. The two could have really stemmed the tide before the SJ outbreak. In less than two minutes, the Barracuda scored three goals and ended Colton Point’s night. As if to show that it wasn’t all on Point, Bow gave up a goal on his first shot against on the evening. Point finished with 11 saves on 16 shots. Mercilessly, the Stars would not allow another goal in the contest. They would also not score another. 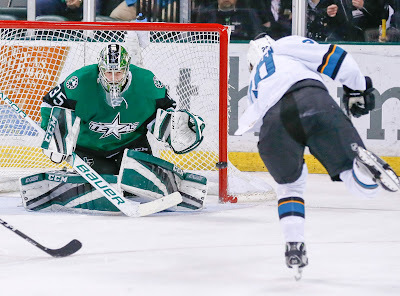 Texas had a late power play that could have provided a bit of a trampoline into their next contest, but San Jose had the best chance of the advantage shorthanded. Texas has a few days to lick their wounds before facing Ontario on the road on Thursday night. 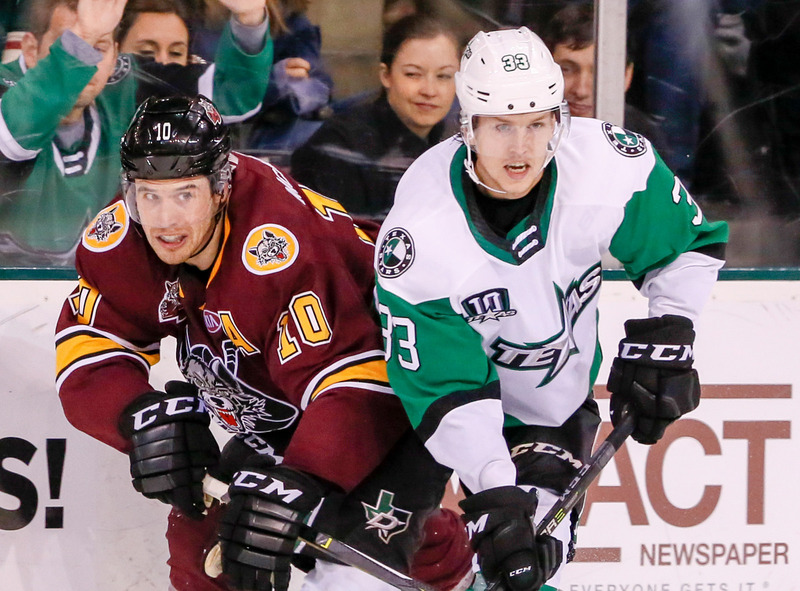 UPDATE: Ondrej Vala has been recalled from Idaho ahead of tonight's game. 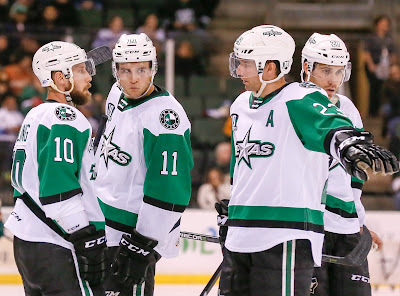 After last night's close 4-3 loss, the Stars aren't down on themselves in the slightest. "We played a good game, had a good finish, we just couldn’t get it done," said Travis Morin. "We’ll look at some video and clean a few things up." With a huge bright spots like the Gurianov-Hintz-Mersch line totalling seven points and Gurianov extending his goal streak to six games, Texas should be able to simply take their effort from last night and copy-paste it onto this evening. Tonight's opponent is similarly strong as last night's. San Jose leads the Pacific Division with six wins in eight games. 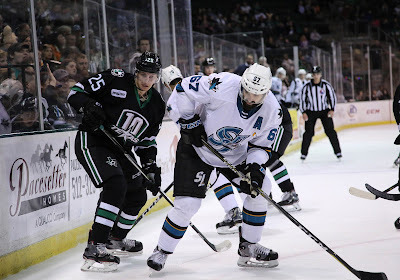 The Barracuda are scoring just fine with 29 goals to their name this season, same as Texas. Francis Perron leads the way with 5-5=10, and rookie Jayden Halbgewachs is just behind at 4-4=8. The real difference, however, has been the play of goaltenders Antoine Bibeau and rookie Josef Korenar. They've split starts evenly with near identical stats. In four games for each, they've both allowed eight goals. Thanks to an OT game, Bibeau's GAA floated down to 1.93 while Korenar's is at 2.01. Bibeau was a free agent pickup from Toronto and Korenar was an undrafted free agent himself. Note that Texas's power play, which had been a sore spot, is now creeping up the standings. The Stars are in 6th in the league with 25.8%. 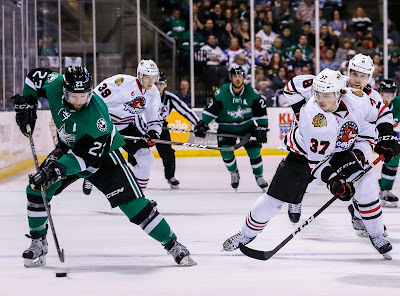 The Texas Stars fell to the Chicago Wolves 4-3 on Friday evening, giving former Stars captain Curtis McKenzie his first win against his former club. Roope Hintz was slotted in between Denis Gurianov and Michael Mersch, the spot recently vacated by Justin Dowling, and feasted with his linemates as Mersch and Dowling tallied two points each, while Hintz finished with a goal and two helpers. McKenzie looks different in burgundy and gold. Gurianov’s goal gave him his sixth straight in as many games, tying a franchise record that was set by Devin Shore in 2015-16. Laxdal was complimentary of his standout forward. 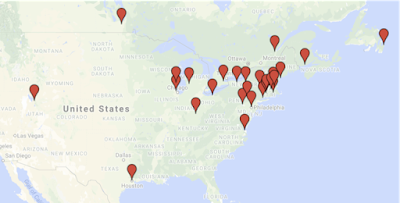 “[Gurianov] is growing. His speed, his puck-handling; he’s got an NHL shot. He’s benefitting from some good players but he’s working hard and maturing in his game. We like the growth that he’s brought so far. Five minutes later, the Wolves answered, coming hard on the forecheck and forcing the Stars cough up the puck. Defenseman Griffin Reinhart was true from the top of the left circle to tie the game, beating Bow blocker side. The Stars had a chance to tie on the power play before the end of the period. Travis Morin set Joel L’Esperance up nicely in the slot for a one timer, but Wolves goaltender Oscar Dansk got just enough of it to send the Stars into the locker room down by one. Gurianov opened the second period with his record-tying goal, ripping one over Dansk’s left shoulder with only eleven ticks off the clock. The top line continued to feast as halfway through the game, Mersch cleaned up a loose puck that Gurianov put on the net to give both players their second point. Brandon Pirri took the buzz out of the crowd less than three minutes later, working again on Bow’s glove with his screaming wrist shot to knot things up once again. “We made a couple D zone entry errors. We dove in on one and they stung us. Pirri’s a good player.” Bow finished with 27 saves on 31 shots. Serendipitously, the Wolves took the lead again right before the end of the period. Nick Caamano was called for interference when he was battling for a loose puck, giving the Wolves their second power play of the game. Winger Daniel Carr showed off some filthy handles while streaking on the rush, freezing Bow with a toe drag and potting a quick wrister. Carr and Pirri both finished the game with a goal and helper. The goal would be the difference in the game, giving Chicago the edge in the special teams department. They finished one for four on the man advantage, while Texas was blanked during their four chances. The Stars did pepper Dansk with fourteen shots to make an impressive push in the final frame, but he held his ground. Morin could find no fault with the effort. The puck drops at 7:00 PM. 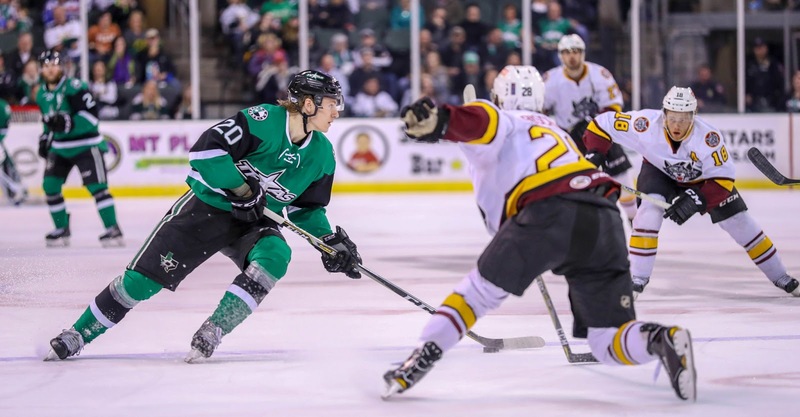 The Texas Stars are aiming for their fourth straight win on Friday evening against the visiting Chicago Wolves, who are just ahead of the Stars in the division standings. They bring with them an old ally. 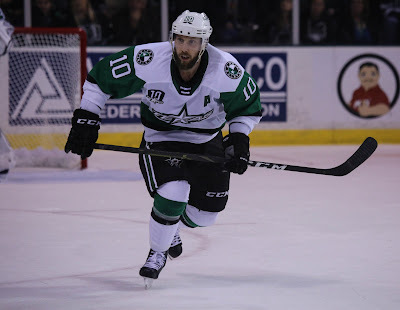 Up until this season, winger Curtis McKenzie hadn't played professionally for any other organization than the Stars, having been drafted by them in 2009 and earning the captaincy as recently as last season. It's hard to forget the Calder Cup run from mere months ago, with McKenzie accounting for 20 points in the playoffs. All that seems like ancient history now, and McKenzie will likely play as if it is. He's been scoring at a point per game pace, yet he's tied for fourth in team scoring with two other players. Standout forward Brook Macek leads them all with ten points, eight of which are goals. There is bound to be some regression for his 66.7 shooting percentage, but the Stars have their work cut out for them against a team that is playing as well as anyone without their special teams firing on all cylinders. Lest we forget, another old friend will be in town for a visit. Max Lagace has earned more starts this season than his backup Oskar Dansk and has made the most of them (.931 SP). Look for him to get the nod against his former team. The main storyline for the streaking Stars headed into this one will be the question of who takes over Justin Dowling's recently vacated top line center spot. The obvious choice is Roope Hintz, who was slotted in on the third line after coming in from Dallas last weekend. Other candidates will be Travis Morin and Joel L'Esperance, the latter of which has earned coach Laxdal's praise at every turn this season. When Brien Rea, the former PR Director and play-by-play man for the Texas Stars of the past four years, was offered a television broadcast position with the Dallas Stars, he had a guy in mind who could potentially maintain the high bar that he had set: Brian Tosti. 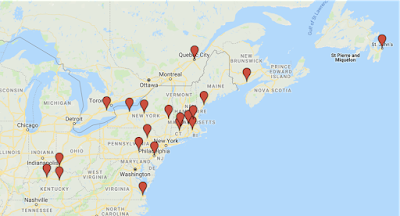 Having grown up in Clifton Park, New York, about thirty minutes north of Albany, hockey was embedded into Tosti’s DNA with the glad support of his parents every step of the way. For him, though, it was much less about personal talent and skill level than it was about the feeling of being a part of something bigger than himself. “Being a part of a team was always the most satisfying thing. I love being a part of a collective group.” That desire would have a huge impact on his career many years down the line. In high school, Tosti explored communications, taking two classes in journalism and broadcasting, which helped him fall in love with the field. To pursue it as a profession didn’t fully materialize as an option in his mind until he was out of high school thinking about a real career path. 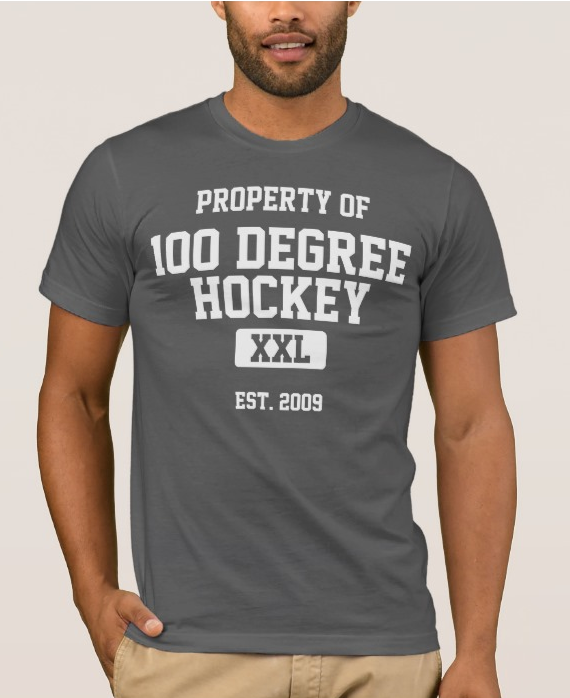 “When you’re 5’6”, it doesn’t take long for you to realize that playing hockey at a high level probably isn’t in the cards.” Though he would go on to lace up his skates for the Division III club team at Oswego State, his alma mater, Tosti fully immersed himself in broadcasting during his second year in college. 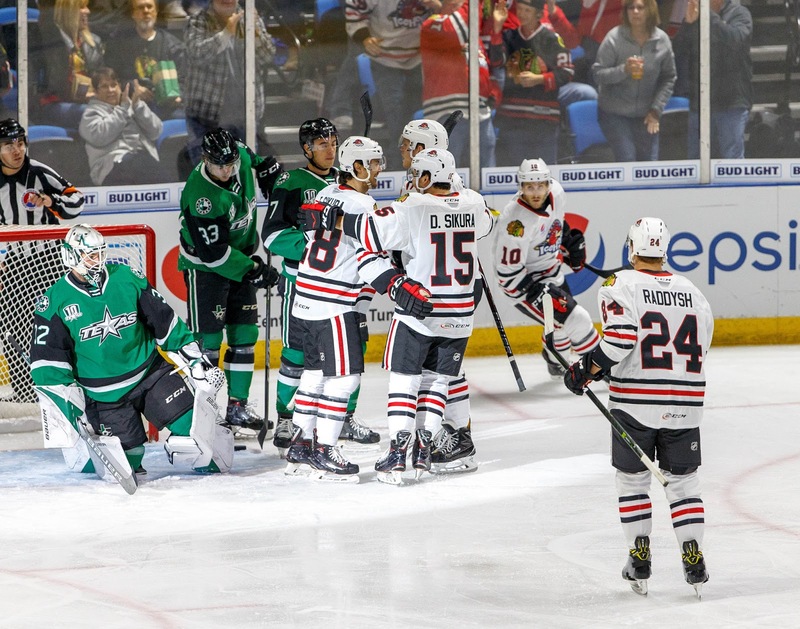 After college, he landed an internship with the Rockford IceHogs, which led to his first full-time professional gig with the then Bloomington Thunder of the USHL. 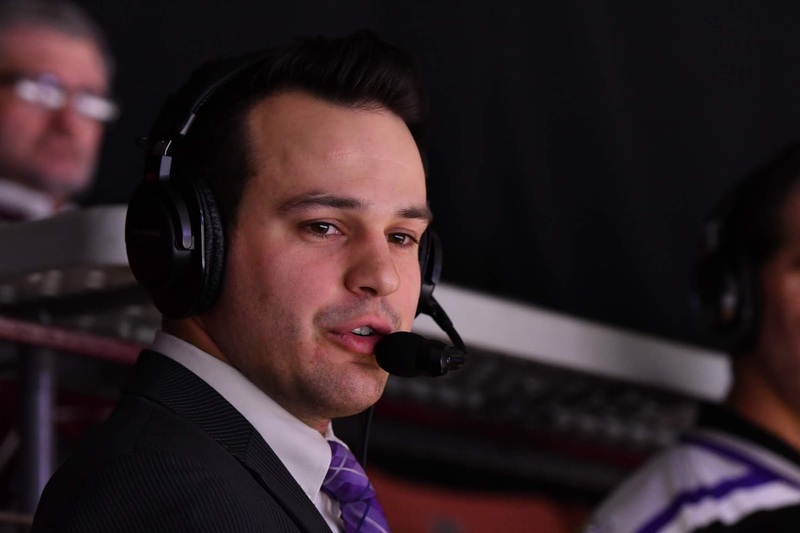 Through a combination of building relationships and working hard over two years, his growing resume parlayed into another two year stop in Greenville, South Carolina, doing play-by-play for the Swamp Rabbits of the ECHL. As with many professions, Tosti says that the challenge becomes going from more of a generalist to a specialist as you move up each level. 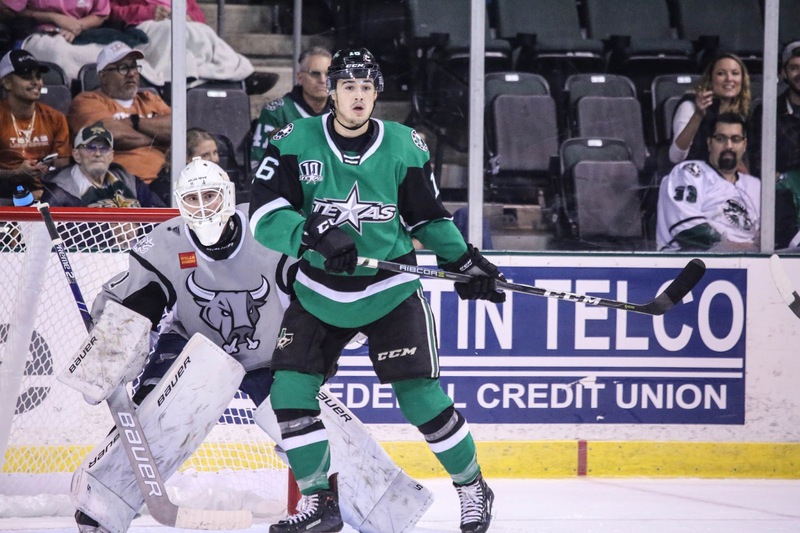 The Texas Stars organization vetted through a short list of candidates provided by Rea and ultimately landed on Tosti after an interview process that mainly allowed his audio portfolio to speak for itself. 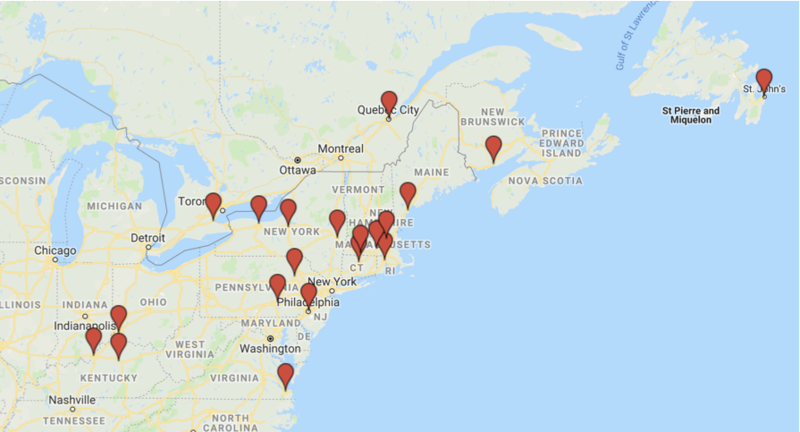 From there, it’s been a whirlwind of logistics--from finding an apartment in Cedar Park, to moving from South Carolina, and going on air within three weeks of pulling into Texas. His things had to stay in boxes the first few weeks while he studied hard to learn the ropes of the new job, which included the players for the organization, not to mention the staff that he would be working with. When asked about his favorite thing about working with the Stars, he beamed about the new relationships he was building with people in and around the organization. Primarily, though, Tosti is fulfilling a desire that has stayed with him since playing hockey in grade school. The Dallas Stars have recalled Justin Dowling from the Texas Stars this morning. With the assignment of Roope Hintz to Texas last weekend, it seemed that a forward callup would be coming in return rather quickly. Jim Nill was in the building on Saturday for tryouts. With everyone assuming Denis Gurianov was top of the list with perhaps a dark horse of Joel L'Esperance, the pick of Dowling is a great reward for the vet forward. Dowling is 2-4=6 in seven games and has NHL experience across nine games two seasons ago. Texas is off until Friday, so we will see how this affects their lineup this weekend, if at all. 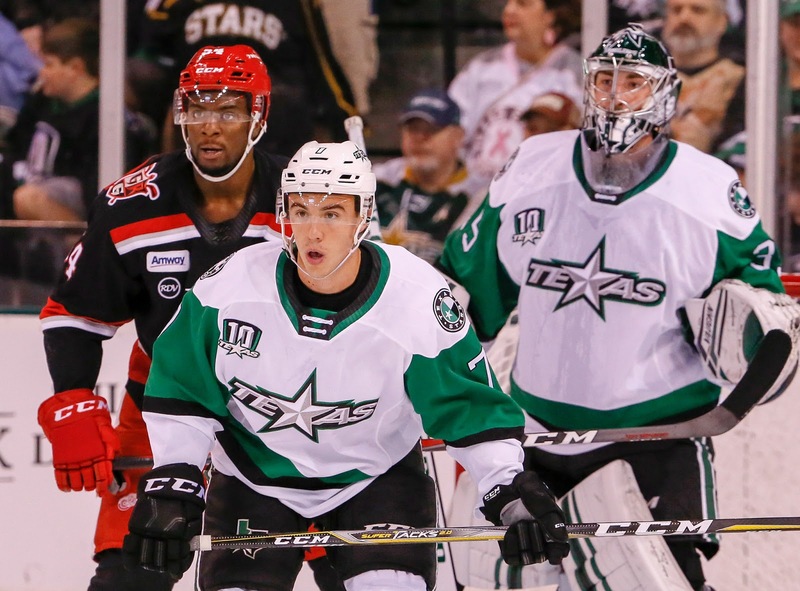 In an unrelated move, Texas also assigned defenseman Nolan Gluchowski to Idaho. 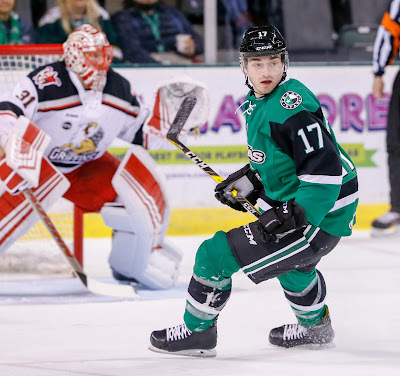 Dallas Stars General Manager Jim Nill announced today that the club has recalled center Justin Dowling from the Texas Stars, Dallas' top development affiliate in the American Hockey League (AHL). Dowling, 28, is tied for first on Texas with four assists in seven games this season, while he also shares third on the team with six points (2-4=6) so far in 2018-19. The center ranks fourth on the squad with 18 shots on goal so far this season. Dowling has registered two assists (0-2=2) in nine career NHL games, all with Dallas coming in the 2016-17 campaign. The 5-foot-10, 180-pound native of Cochrane, Alta. was originally undrafted and signed as a free agent by Dallas on March 26, 2014. On the back of another great third period, Texas claimed first place in the division with a 3-1 victory over the visiting Iowa Wild tonight. The kids are alright, it turns out, as Joel L’Esperance, Denis Gurianov and Colton Point all factored into the win in big ways. Denis Gurianov continued his hot play with his fifth goal in as many games. Laxdal noted that he’s also been one of the team’s best backcheckers, and he plans to use him on the penalty kill starting next weekend. It was a relatively quiet first period for both clubs with no goals and no penalties either way. The best chance of the frame came late as Michael Mersch collected his own rebound and attempted to go left to right across the crease to beat Kahkonen. The rookie netminder extended his pad to keep it scoreless. The legend of Joel L’Esperance continued to grow in the second period. The young forward had a drive-by tip play on a point shot from Joel Hanley to open the scoring. 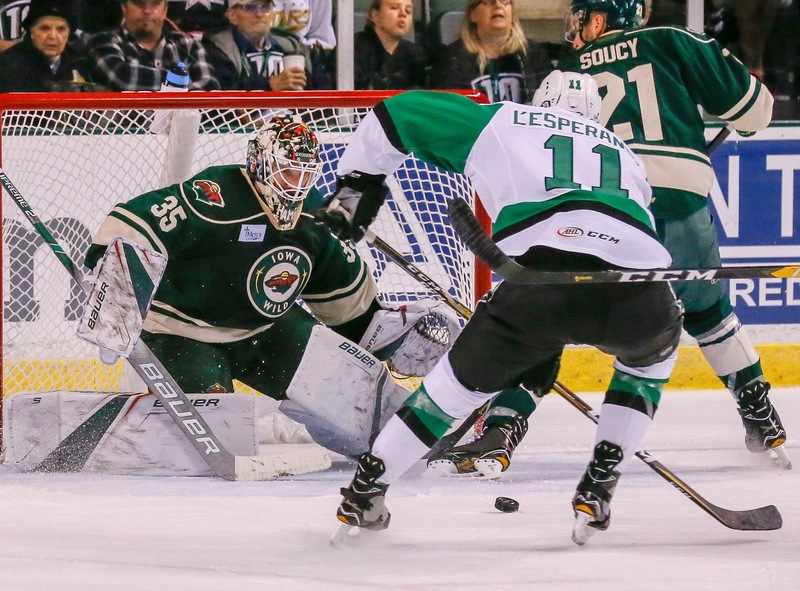 The Stars would capitulate nine minutes later as former Steelhead Colton Beck broke into the zone with Niklas Hansson draped on him. The play would have been a minor penalty, if not a penalty shot, but Beck buried it for the tie. Iowa had a few posts in the second that surely made Texas nervous. One off the left post ended with Colton Point snow angeled in the crease and a frantic sequence in the Stars zone a few minutes later saw the Wild ding the crossbar on an open net. In the third period, Laxdal made a common adjustment to put the newly assigned Roope Hintz with Gurianov. The change yielded goals from both the line he left and the line he joined. “The addition of Roope Hintz gave our group energy moving forward,” he noted. First, Erik Condra found the net on his first of the season with an easy tap-in backdoor on Colton Hargrove’s initial chance. That pushed the score to 2-1. Late in the third, the Stars finally got their first power play of the night and didn’t miss out on the opportunity. Denis Gurianov popped one in high on Kahkonen from the hashes for the 3-1 lead and the final. Roope Hintz had the first assist, and Joel Hanley got his second assist of the night as well. The Stars would hold strong with the empty net and emerge with 10 points in the standings to hold onto first with an idle Milwaukee and Chicago in the loser column. Texas has a long layoff now until their next game on Friday when Chicago comes to town. Gavin Bayreuther is expected back next weekend after missing this weekend’s contests. 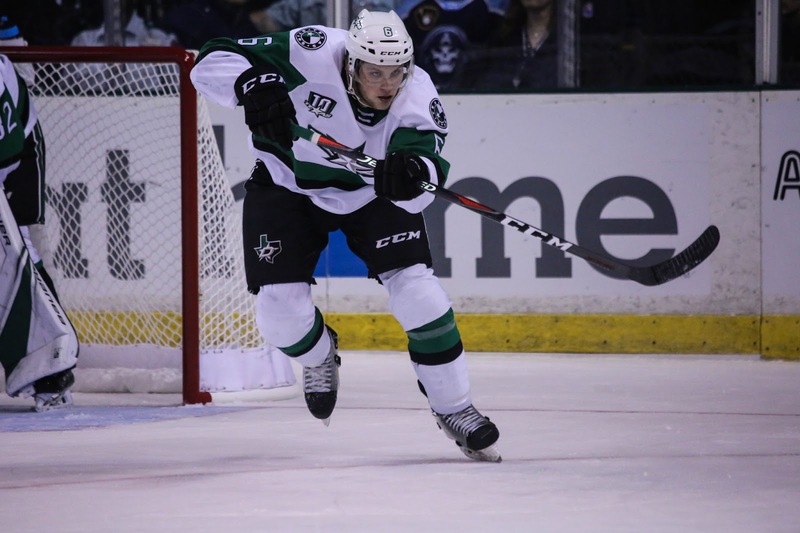 UPDATE: Roope Hintz has been sent to the Texas Stars. Elgin Pearce was assigned to Idaho. 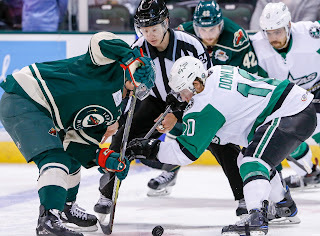 Texas handed the Wild their first loss of the season last night here in Cedar Park. The frenetic third period, headed up by two rookies, put the Stars past Iowa. Joel L'Esperance and Ben Gleason were the headlinders. "[L'Esperance] is a big heavyset centerman," said Laxdal last night. "He reminds a lot of Jay Beagle when I brought him out of college in Idaho, and that’s kind of the comparisons we’re trying to use with him. He’s got an offensive upside, he’s a big heavy player and his skating’s getting better; he’s gaining confidence. He plays a heavy game and he’s got a good skillset." Switching Ben Gleason to the top PP unit last night helped further activate a special teams crew that is now sixth in the league (26.9%). Iowa is also hot. Going into last night, they were fifth and now they're 3rd (33.3%). "We’ve needed to score a lot more goals on the power play," said Gleason. "And it’s been working for us the last couple of games and right now it’s working." 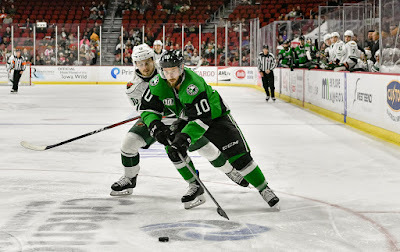 The Texas Stars handed the Iowa Wild a 5-4 loss on Friday in Iowa’s first road game of the season. Ben Gleason, Michael Mersch, Nick Caamano, Joel L'Esperance, and Denis Gurianov all found the back of the net for the Stars with four of the goals coming in a blitzkrieg third period. Special teams were a big theme headed into this one with the Wild ranking fifth in both the power play and the penalty kill. 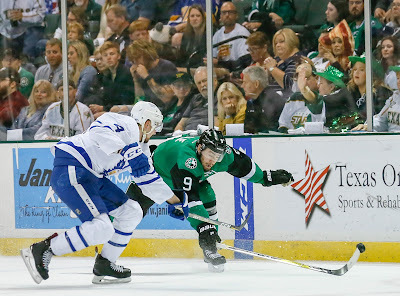 Two early penalties taken by the Stars killed any momentum they possessed up to that point from an early Justin Dowling breakaway chance that led to a power play. After the dust settled, the Stars walked away unscathed in the first period thanks to Landon Bow. Bow would finish the game with 25 saves on 29 shots. The Stars would've liked to get more shots on net in the first period, as they were outshot 13-6, but they generated a few golden chances that won't show up on the score sheet. Dowling and Mersch made some magic on two different back door feeds but couldn’t quite case in. As time expired for the first twenty minutes of play, L'Esperance forced a five hole attempt off a rebound from a Travis Morin shot. Though the Stars amassed four power play opportunities in the second period they also ceded two to the Wild. As you would expect, the hot power play unit for Iowa took advantage. 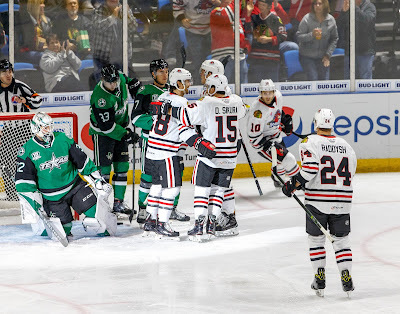 After killing their own power play by taking committing a careless hooking minor in the offensive zone, the Stars gave up the first goal of the game to winger Kyle Rau when he came in hot towards the net about fourteen minutes into the frame. The Stars answered the goal in a big way a couple shifts later. After earning almost a full minute of 5-on-3 play, they probed, prodded, and peppered their way to some decent chances but couldn’t yet solve goaltender Andrew Hammond. Once the Wild got their fourth man back on the ice, Gleason called his own number in the neutral zone as he dangled his way past a back checker, beating Hammond cleanly over his right shoulder with two and a half minutes left in the second period. The third period was some of the very best hockey that the AHL has to offer, or at least some of the most entertaining. “The adjustments made in the third I thought paid dividends, and give our guys a lot of credit for executing the adjustments that we put in,” said Laxdal. Liambas’s tally less than two minutes into the final frame took the air out of the building at first. Bow was heavily screened and really had no chance to track the puck. Mersch’s game-tying goal came three minutes later with L’Esperance went behind the net and set him up nicely in the slot. 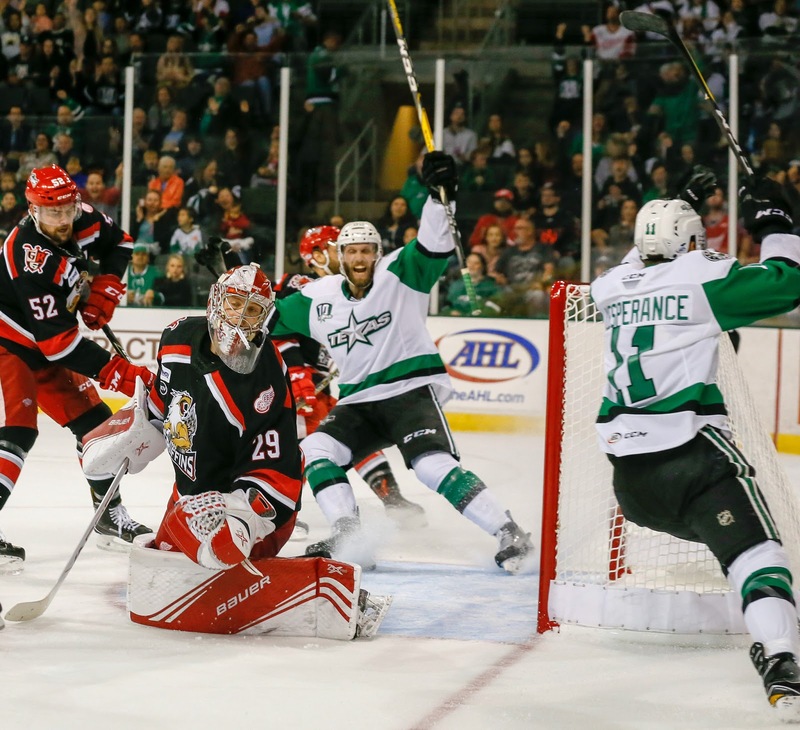 One shift later, the Stars pulled ahead when Caamano scored on the rush, notching his second goal of the season. Wild captain Cal O’Reilly responded with a back hand goal near the thirteen minute marker to knot the game up again. One of the adjustments that Laxdal was referring to in the third period was putting Gleason with the top power play unit. The Stars continued to ravage the Wilds’ impressive special teams stat sheet with their second power play goal a couple minutes after the O’Reilly marker. They cycled for about one minute and ten seconds until Gleason found L’Esperance waiting near the crease pulling the Stars ahead by one. With just over five minutes left in the game, the Stars found a huge insurance goal after Mersch just missed a wide open net on a wrap around attempt. The puck cycled back to Gurianov who buried it from the left circle, tallying his sixth point in as many games. The Wild had enough fight in them to draw one more penalty in the dying minutes of the game and cashed in again to make the Stars sweat for about thirty seconds. Perhaps it gave the Stars something to think about for tomorrow’s game to complete the weekend set against the Wild. The puck drops drops at 7:00 PM CDT. 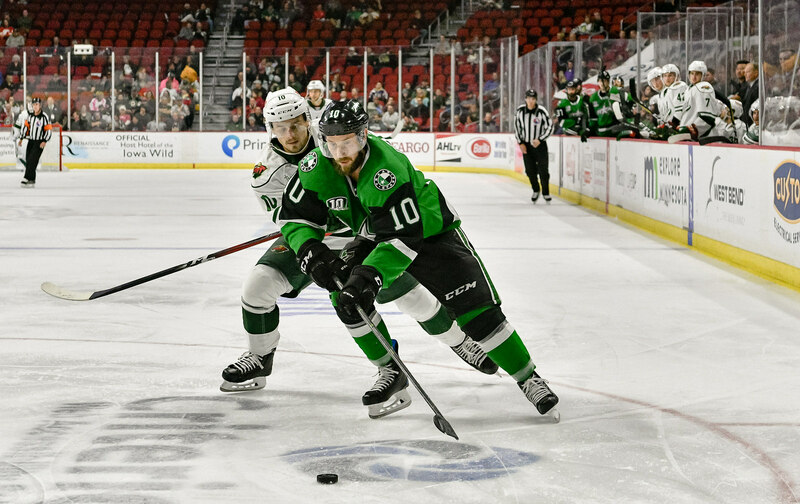 The Iowa Wild head to central Texas this weekend for their first road game sporting an unblemished record in the budding new AHL season. 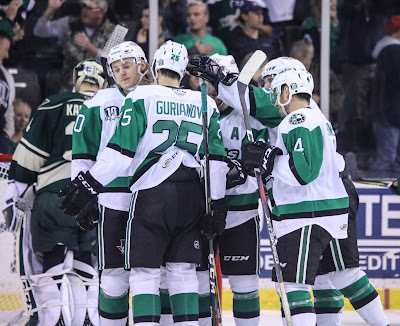 They thumped the Manitoba Moose in their opening game set, outscoring them 12-2 over two games, and handed the Stars a 4-3 shootout loss. Get used to seeing this team a lot this season with the new division alignment. A couple of youngsters are getting it done in the scoring department for the Wild: rookie forwards Gerry Fitzgerald and Mason Shaw with four points a piece. Statistically, the Wild also hold up against any team in the AHL. That's what a small sample size will do at this juncture. But some numbers do stand out more than others. They are top five in both the power play (30.8%) and the penalty kill (91.7%). Four of their goals have come on the man advantage this year. All things considered during their impressive early-season run, the biggest story so far coming out of Iowa is well-traveled net minder Andrew Hammond. Having drawn spot duty for the Colorado Avalanche during their unexpected playoff run last year, his experience and savvy has so far buoyed the Wild to the tune of a .939 save percentage across all three starts. Stars fans are very familiar with the type of effect a quality veteran goaltender can have on his team and how that can produce unbridled confidence throughout the lineup. Remember the last season's playoffs? As well as the Wild have played, the Stars match them in points, and have had to play three road games to the Wild's none. 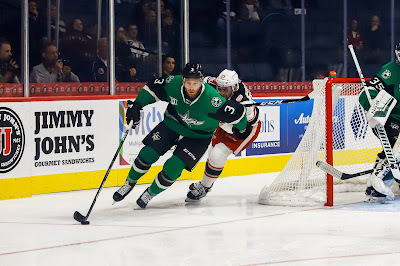 They put together a successful display of offense on against the Grand Rapids Griffins on Wednesday with six goals and are receiving welcome contributions from players who have become very critical all of a sudden. Denis Gurianov, Michael Mersch, and Joel L'Esperance all lead the team in scoring with five points each. That's a ton of size and scoring ability that you like to see clicking this early. This will be as good of a test as you will get this time of year. The puck drops at 7 PM CDT. 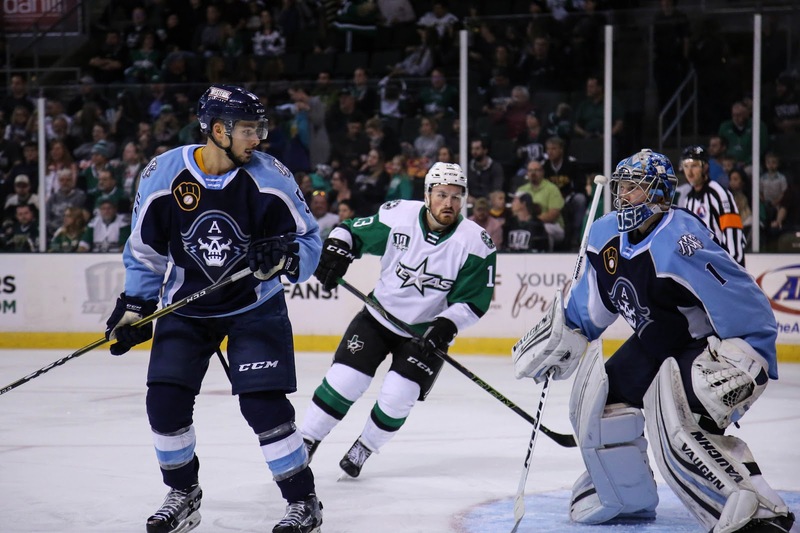 The Texas Stars are in the air at the moment, but the team has made a move to add to their defense. Defenseman Nolan Gluchowski has been recalled from Idaho this afternoon. Reece Scarlett was downed in the first game by an ACL tear and isn't expected to play again this season. Gavin Bayreuther missed last night's game as well. More info will be gleaned tomorrow concerning Bayreuther. 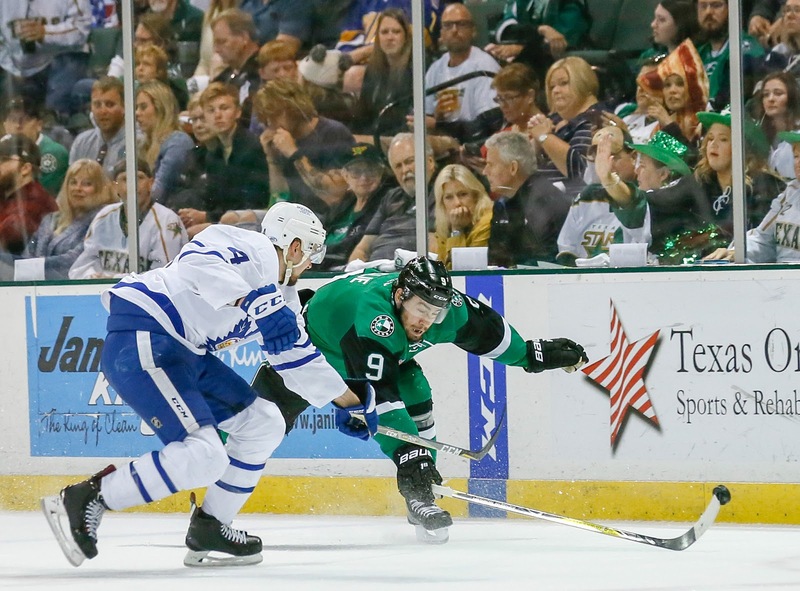 Gluchowski comes to Texas after racking up six penalty minutes and a minus-3 rating in the Steelheads opening trio of games. 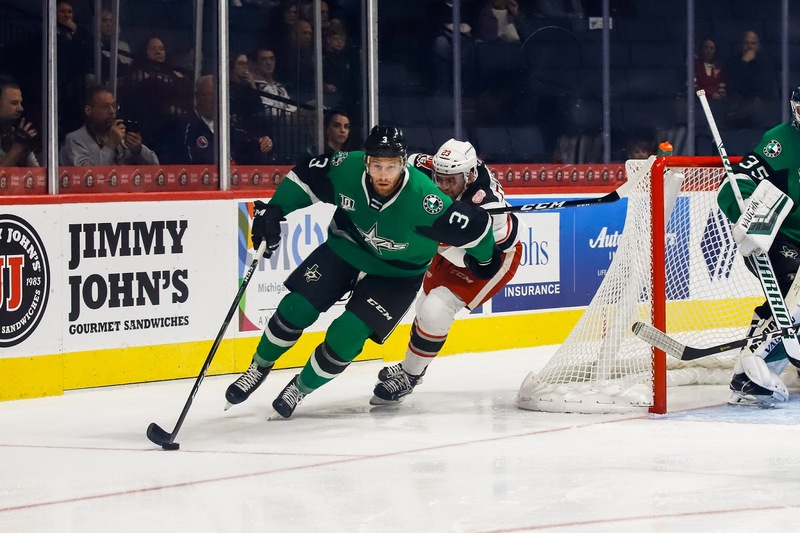 Texas salvaged their first road trip of the season with a win in Grand Rapids this evening. The back-and-forth game saw Texas emerge victorious in a 6-3 final score. 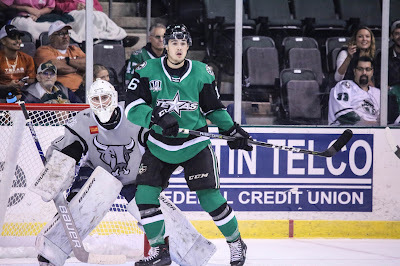 Landon Bow came up big in the first period to keep Texas in it, and Joel L'Esperance and Adam Mascherin found chemistry on a new line combo with Travis Morin. Denis Gurianov had the game winning goal as he knocked a puck into the net completely out of mid air on the power play. Texas tallied three power play goals on the night, including a 5-on-3, firmly shaking off their man-advantage demons from the previous few games. In addition, they were only shorthanded three times on the night. It was Texas getting the first goal in this one as Joel L'Esperance continued his excellent start to the season, collecting his third tally. It was an unassisted marker, but Adam Mascherin's initial shot created the havoc that led to L'Esperance putting it away. It was a power play goal, just Texas's second of the season. Grand Rapids had a chance to tie it up on a penalty shot by Wade Megan a few minutes later but Bow stopped that. It was only a matter of time before Chris Terry notched his first of the year. It came in the eighth minute on a tip from Saarijarvi's initial shot. Not far from his collegiate home in Ann Arbor, Tony Calderone picked up his first of the year after Colton Hargrove slipped through three Griffins D-men and passed it over to him for the 2-1 tally. It was short-lived as Matt Finn tied things up. A missed pass in the GR zone from Dowling to Gurianov went the other way and fast. Finn beat Bow five hole and 2-2 was the score after 20. The lone score in the second period was a tip play by Axel Holmstrom off a shot from Jake Chelios. Texas roared back in the third period with Adam Mascherin being the beneficiary of a slick pass from Joel L'Esperance this time to tie it at three. Immediately after, Texas went to the power play with Mascherin drawing the call. Gurianov popped in his third in as many games to go ahead 4-3. From there, the Griffins just fell apart. Another power play became a 5-on-3 for 68 seconds. Michael Mersch scored on the doorstep to make it 5-3, his first as a Star. Nick Caamano polished things off with an empty net goal in the dying minutes to make the final 6-3. Texas heads home to take on the Iowa Wild on Friday and Saturday. The start of the season has definitely not gone the way the Griffins wanted it to. Four games in, they've got just two points to their name. However, they've also had the misfortune of playing most of those games on the road. Their lone win came at home against Hershey last weekend. Tonight's midweek bout is just their second home game of the season. With the exception of the Hershey game, the Griffins have had trouble putting pucks in the net. Their six goal outburst against the Bears accounts for 75% of their goals. In their games against Texas and Chicago they were held to one by Landon Bow and Max Lagace, respectively. Ville Husso shut them down completely in San Antonio. Texas, on the other hand, has had no trouble scoring. They've scored three goals in every game. However, their only win was on opening night when they allowed just a single goal against. And so, as it so often happens in sports, something's gotta give. These two teams do have some game tape to review between the clubs as Texas beat GRG on opening night in Cedar Park. Joel L'Esperance had the game-winning tally, and Landon Bow got the win. Filip Zadina, the Griffin's flashy rookie, finally got on the board in that Hershey win with a pair of goals. Otherwise, he's had nothing. That doesn't feel like it can last for long. Watch for him. Penalties have been an issue for Texas so far this season as they've been shorthanded 21 times in 4 games. That's near the top of the league (tied for 7th). 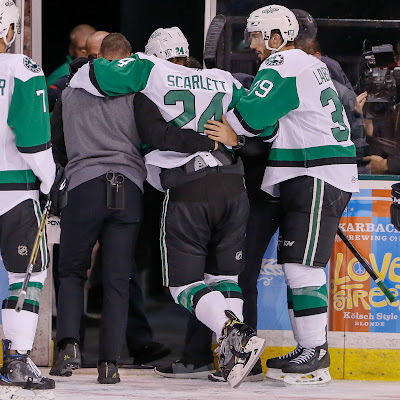 Their PK has been good because they've needed it to, but it's definitely not helping that Reece Scarlett is now out for the season with an ACL injury. The steady hand of an experienced vet defenseman on the backend will be missed, especially in those PK situations. Texas, which has only had one power play goal this season, could have a breakout chance against a middling GR penalty kill. They've allowed 3 themselves (same as Texas) but on fewer opportunities to rank 21st in the league at 78.6%.